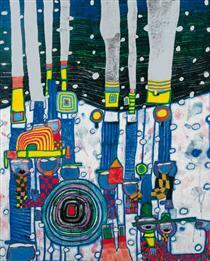 Friedensreich Regentag Dunkelbunt Hundertwasser (December 15, 1928 – February 19, 2000) was an Austrian-born New Zealand artist and architect who also worked in the field of environmental protection. 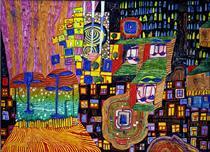 Hundertwasser (German for "hundred waters") is a pseudonym; he was born Friedrich Stowasser. Hundertwasser stood out as an opponent of "a straight line" and any standardization, expressing this concept in the field of building design. 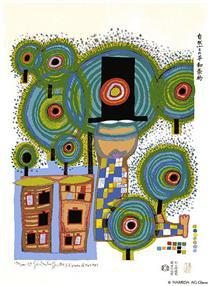 His best known work is the Hundertwasserhaus in Vienna, Austria which has become a notable place of interest in the Austrian capital, characterized by imaginative vitality and uniqueness. 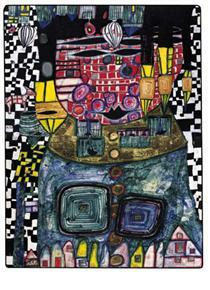 The Second World War was a very difficult time for Hundertwasser and his mother Elsa, who were Jewish. 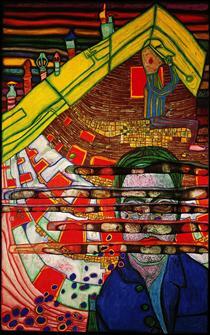 They avoided persecution by posing as Christians, a credible ruse as Hundertwasser's father had been a Catholic. 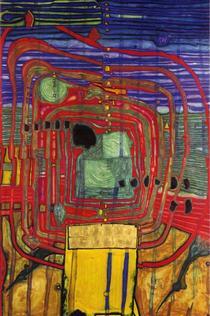 Hundertwasser was baptized as a Catholic in 1935. 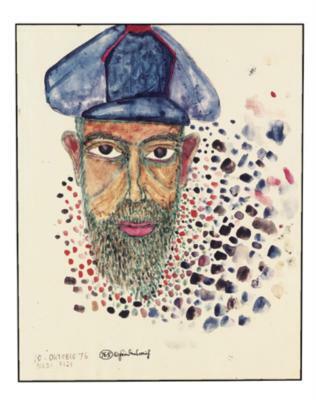 To remain inconspicuous Hundertwasser also joined the Hitler Youth. 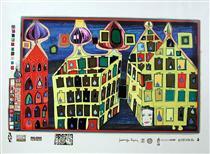 Hundertwasser developed artistic skills early on. After the war, he spent three months at the Academy of Fine Arts in Vienna. 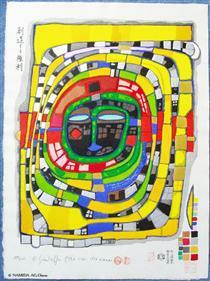 At this time he began to sign his art as Hundertwasser instead of Stowasser. He left to travel using a small set of paints he carried at all times to sketch anything that caught his eye. In Florence he met the young French painter René Brô for the first time and they became lifelong friends. 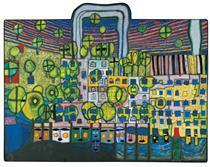 Hundertwasser's first commercial painting success was in 1952–53 with an exhibition in Vienna. His adopted surname is based on the translation of "sto" (the Slavic word for "(one) hundred") into German. The name Friedensreich has a double meaning as "Peace-realm" or "Peace-rich" (in the sense of "peaceful"). 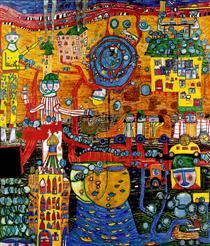 Therefore, his name Friedensreich Hundertwasser translates directly into English as "Peace-Realm Hundred-Water". The other names he chose for himself, Regentag and Dunkelbunt, translate to "Rainy day" and "Darkly multi-coloured". In the early 1950s, he entered the field of architecture. 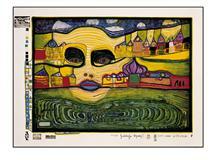 Hundertwasser also worked in the field of applied art, creating flags, stamps, coins, and posters. His most famous flag is his koru flag, as well as several postage stamps for the Austrian Post Office. He also designed stamps for Cape Verde and for the United Nations postal administration in Geneva on the occasion of the 35th anniversary of the Universal Declaration of Human Rights. 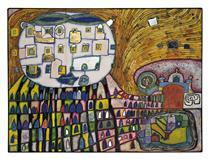 In 1957 Hundertwasser acquired a farm on the edge of Normandy. 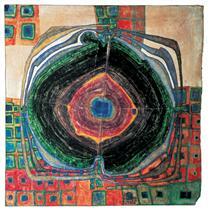 Hundertwasser married Herta Leitner in 1958 but they divorced two years later. 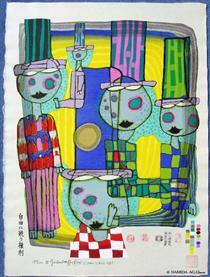 He married again in 1962 to the Japanese artist Yuko Ikewada but she divorced him in 1966. He had gained a popular reputation by this time for his art. 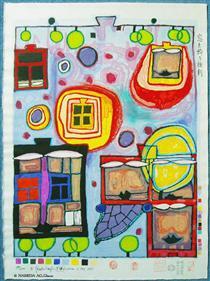 In 1964 Hundertwasser bought "Hahnsäge", a former saw mill, in the sparsely populated Lower Austria's Waldviertel. There, far from the hustle and bustle and surrounded by nature, he set up a new home. 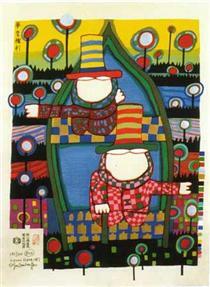 In 1972 Hundertwasser incorporated in Switzerland, the "Grüner Janura AG", which was renamed in "Namida AG" 2008. 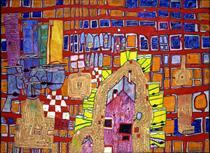 Via this stock company Hundertwasser managed his intellectual property rights. 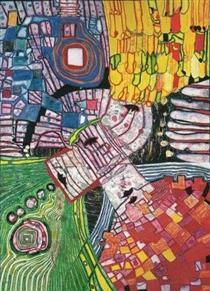 In the 1970s, Hundertwasser acquired several properties in the Bay of Islands in New Zealand, which include a total area of approximately 372 ha of the entire "Kaurinui" valley. There he realized his dream of living and working closely connected to nature. Beside other projects he designed the "Bottle House" there. He could live largely self-sufficient using solar panels, a water wheel and a biological water purification plant. Also his first grass roofs experiment took place here.